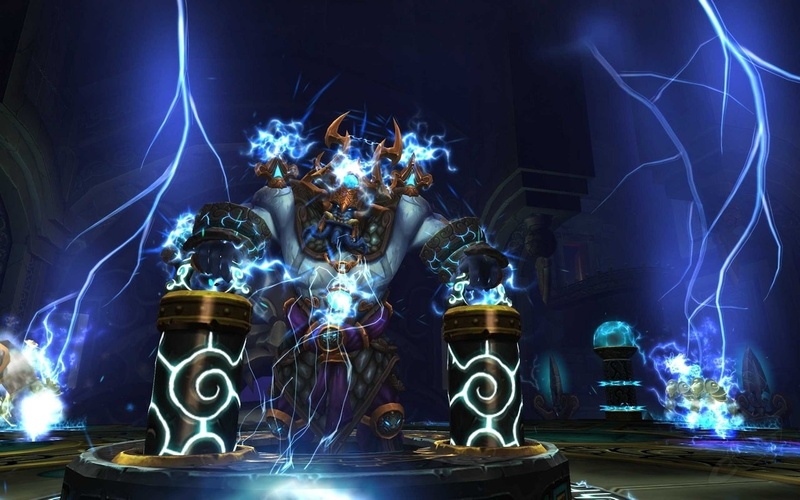 Last weekend, I jumped on LFR Pinnacle of Storms and landed into a DPS slot for Lei Shen. Now, personally, this has to be one of the most complicated LFR fights I've seen. Run here, kill that add, stand there, make sure he's against the pilar, now for phase 2... That night, we successfully downed him on our fourth attempt. After watching the videos, I wasn't prepared. First off, you ARE supposed to stand in the goo. There's white goo, and blue goo and sparkly goo. You stand in two, but not the other. On top of that, the ground sparkles and various pieces light up with a neon glow. Looking back at the videos, I wasn't standing in the right place, but running away from it, but standing on a harmless floor tile that was simply lit up with neon. In addition, I could have died if not for some fast acting players who stacked on me when I had the static charge on me. See, I'd always thought of the earlier content as training material. Quests teach you the new mechanics, dungeons and scenarios introduce to you how it can be applied, raiding combines them together. Right? Outside of another raid, when did we learn the wind element? Outside of friendly healers dropping happy zones, when have we learned you must stand in the sparkly things bosses drop?